Assistant Adjutant-General, U.S. Army, Arlington, Va.
SIR: In obedience to instructions received on the 20th instant, the division under my command was under arms in light marching order, with two days' cooked rations in their haversacks, and commenced the march at 2.30 a.m. on the 21st, the brigade of Colonel Franklin leading, followed by those of Colonels Willcox and Howard. At Centreville we found the road filled with troops, and were detained three hours to allow the divisions of General Tyler and Colonel Hunter to pass. I followed with my division immediately in rear of the latter. Between two and three miles beyond Centreville we left the Warrenton turnpike, turning into a country road on the right. Captain Wright, of the Engineers, accompanied the head of Colonel Hunter's column, with directions to stop at a road which turned in to the left to a ford across Ball Run, about half way between the point where we turned off from the turnpike and Sudley Springs, at which latter point Colonel Hunter's division was to cross. No such road was found to exist, and about 11 a.m. we found ourselves at Sudley Springs, about ten miles from Centreville, with one brigade of Colonel Hunter's division still on our side of the run. Before reaching this point the battle had commenced. We could see the smoke rising on our left from two points, a mile or more apart. Two clouds of dust were seen, showing the advance of troops from the direction of Manassas. At Sudley Springs, whilst waiting the passage of the troops of the division in our front, I ordered forward the First Brigade to fill their canteens. Before this was accomplished the leading regiments of Colonel Hunter's division became engaged. General McDowell, who, accompanied by his staff, had passed us a short time before, sent back Captain Wright, of the Engineers, and Major McDowell, one of his aides, with orders to send forward two regiments to prevent the enemy from outflanking them. Captain Wright led forward the Minnesota regiment to the left of the road which crossed the run at this place. Major McDowell led the Eleventh Massachusetts Regiment up the road. I accompanied this regiment, leaving orders for the remainder of the division to follow, with the exception of Arnold's battery, which, supported by the First Michigan, was posted a little below the crossing of the run as a reserve. At a little more than a mile from the ford we came upon the battlefield. Ricketts' battery was posted on a hill to the right of Hunter's division and to the right of the road. After firing some twenty minutes at a battery of the enemy placed just beyond the crest of a hill on their extreme left, the distance being considered too great, it was moved forward to within about one thousand feet of the enemy's battery. Here it was exposed to a heavy fire of musketry, which soon disabled the battery. 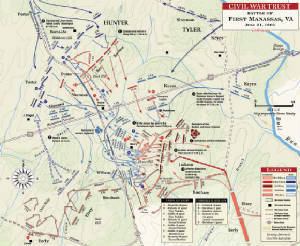 Franklin's brigade was posted on the right of a woods near the center of our line, and on ground rising towards the enemy's position. In the mean time I sent orders for the zouaves to move forward, to support Ricketts' battery on its right. As soon as they came up I led them forward against an Alabama regiment, partly concealed in a clump of small pines in an old field, At the first fire they broke, and the greater portion fled to the rear, keeping up a desultory firing over the heads of their comrades in front. At the same moment they were charged by a company of secession cavalry on their rear, who came by a road through two strips of woods on our extreme right. The fire of the zouaves killed four and wounded one, dispersing them. The discomfiture of this cavalry was completed by a fire from Captain Colburn's company of U. S. cavalry, which killed and wounded several more. Colonel Farnham, with some of his officers and men, behaved gallantly, but the regiment, as a regiment, did not appear again on the field. Many of the men joined other regiments, and did good service as skirmishers. I then led up the Minnesota regiment, which was also repulsed, but retired in tolerably good order. It did good service in the woods on our right flank, and was among the last to retire, coming off the field with the Third U.S. Infantry. Next was led forward the First Michigan, which was also repulsed, and retired in considerable confusion. They were rallied, and helped to hold the woods on our right. The Brooklyn Fourteenth then appeared on the ground, coming forward in gallant style. I led them forward to the left, where the Alabama regiment had been posted in the early part of the action, now disappeared. We soon came in sight of the line of the enemy, drawn up beyond the clump of trees. Soon after the firing commenced the regiment broke and ran. I considered it useless to attempt to rally them. The want of discipline in these regiments was so great, that the most of the men would run from fifty to several hundred yards to the rear and continue to fire---fortunately for the braver ones, very high in the air-- repelling those in front to retreat. During this time Ricketts' battery had been taken and retaken three times by us, but was finally; lost, most of the horses having been killed; Captain Ricketts being wounded, and First Lieut. D. Ramsay killed. Lieutenant Kirby behaved with great gallantry, and succeeded in carrying off one caisson. Before this time heavy re-enforcements were distinctly seen approaching by two roads, extending and outflanking us on the right. Colonel Howard's brigade came on the field at this time, having been detained by the general as a reserve at the point where we left the turnpike. It took post on a hill on our right and rear, and for some time gallantly held the enemy in check. I had one company of cavalry attached to my division, which was joined during the engagement by the cavalry of Colonel Hunter's division. Major Palmer, who commanded them, was anxious to engage the enemy. The ground being unfavorable, I ordered them back out of range of fire. Finding it impossible to rally any of the regiments, we commenced our retreat about 4.30 p.m. There was a fine position a short distance in rear, where I hoped to make a stand with a section of Arnold's battery and the U.S. cavalry, if I could rally a few regiments of infantry. In this I utterly failed, and we continued our retreat on the road we had before advanced in the morning. I sent forward my staff officers to rally some troops beyond the run, but not a company would form. I stopped back a few moments at the hospital, to see what arrangements could be made to save the wounded. The few ambulances that were there were filled, and started to the rear. The church which was used as a hospital, with the wounded and some of the surgeons, soon after fell into the hands of the secession cavalry, who followed us closely. A company of cavalry crossed the run, and seized an ambulance full of wounded. Captain Arnold gave them a couple of rounds of canister from his section of artillery, which sent them scampering away, and kept them at a respectful distance during the remainder of our retreat. At this point most of the stragglers were in advance of us. Having every reason to fear a vigorous pursuit from the enemy's fresh troops, I was desirous of forming a strong rear guard, but neither the efforts of the officers of the Regular Army nor the coolness of the regular troops with me could induce them to form a single company. We relied entirely for our protection on one section of artillery and a few companies of cavalry. Most of the road was favorable for infantry, but unfavorable for cavalry and artillery. About dusk, as we approached the Warrenton turnpike, we heard a firing of rifled cannon on our right, and learned that the enemy had established a battery enfilading the road. 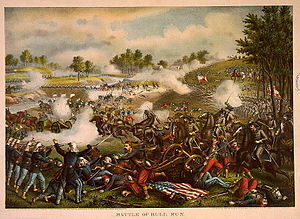 Captain Arnold, with his section of artillery, attempted to run the gauntlet, and reached the bridge over Cub Run about two miles from Centreville, but found it obstructed with broken vehicles, and was compelled to abandon his pieces, as they were under the fire of those rifled cannon. The cavalry turned to the left, and, after passing through a strip of woods and some fields, struck a road which led them to some camps occupied by our troops in the morning, through which we regained the turnpike. About 8 p.m. we reached the camps we had occupied in the morning. Had a brigade from the reserve advanced a short distance beyond Cub Run near one-third of the artillery lost might have been saved, as it was abandoned at or near this crossing. Such a rout I never witnessed before. No efforts could induce a single regiment to form after the retreat was commenced. Our artillery was served admirably, and did much execution. Some of the volunteer regiments behaved very well, and much excuse can be made for those who fled, as few of the enemy could at any time be seen. Raw troops cannot be expected to stand long against an unseen enemy. I have been unable to obtain any report from the zouaves, as Colonel Farnham was wounded, and is sick in the hospital. I have only the list of the killed and wounded. Since the retreat more than three-fourths of the zouaves have disappeared. The brigade and regimental reports, with the lists of the killed and wounded, are inclosed herewith. I beg leave to express my obligations to the officers of my staff, viz: Capt. Horatio G. Wright, Lieut. G. W. Snyder, and Lieut. Francis U. Farquhar, of the Engineers; Capt. Chauncey McKeever, assistant adjutant-general; Lieut. John J. Sweet, Second Cavalry, and Lieut. John D. Fairbanks, First Michigan Regiment, for the able and fearless manner in which they performed their duties, and to recommend them to your favorable consideration. Colonel Seventeenth Infantry, Commanding Division.